To apply for ACT accommodations, you need to first register for a test date with standard time and conditions. This hurdle often results in families waiting to apply. It is better to just register for a test date even if you do not plan to sit for that test. That way, you can move ahead with the process of applying, get your accommodations in place, and know what the testing conditions will be before making a testing plan. Once the accommodations are approved, you are all set to use them for any test date going forward. If the accommodations are not approved, you have time to go through the re-application process. When applying, provide as much of a paper trail as possible of documentation and use. For most accommodations, the student must have had a psycho-educational evaluation within the last three years and should have either an IEP or 504 plan set up in school. Request this only if you can test at a regularly scheduled national test center under standard time limits and use either a regular type (10-pt.) or large type (18-pt.) test booklet, but require other accommodations due to your disability. All scores achieved through National Testing are reported as "National." No details about any accommodations provided are reported. Request this only if you can test at a regularly scheduled national test center and use either a regular type (10-pt.) or large type (18-pt.) test booklet, but require up to 50% more time due to your disability. · Student/parent must fill out a portion of the form and a school official (counselor, special education teacher, principal) must fill out another portion of the form. · Send in filled out form with all supporting documentation and a copy of your ticket for standard time testing. Special Testing (at school) for both ACT and ACT with writing is available only during the designated three-week testing windows listed on the request form. · This application: http://www.actstudent.org/regist/disab/opt3.html will be filled out and submitted by the Special Testing coordinator at your school. It is important to identify this person as early as possible and communicate what accommodations you would like to request and when. You should review with them the deadlines for submission and ask to review the application prior to its submission to make sure it is complete and correct. • All extended time test-takers must start and finish each section at the same time. This means that, if examinees finish a section before time is called, they must wait quietly for the time to run out before continuing on to the next section, even if they are ready to continue. In the ACT’s FAQ, the test-makers announced that “if all examinees in the room are finished, then the group of examinees can move to the next test.” This is unfortunate. If the proctor asks if you are ready to move on to the next section before time is called, the answer should always be a hard "NO!" If you are done with a section early, take that time to rest and re-charge, so you are ready to be fully focused through the next section. • If you are taking the optional writing test (aka. ACT essay), students with time-and-a-half will continue to receive 60 minutes to complete the ACT essay. For multi-day testing, a student has a designated three-week window to complete the test. The student can take the test over the course of one to five days within that window. The student will take the test at his or her school. · How many days of testing are appropriate for your child? · Over what time period will the tests occur? · What time of day will the tests occur? · Who will proctor and where? · If more than one test is being taken in a day, how long will the breaks be? For multi-day testing, you can get 50% extra time, 100% extra time or 300% extra time. The percent extra time you request should be based on your documentation and what you receive at school. The 300% extra time is typically reserved for students who require a DVD or a reader. · If you have a disability, document it and get in school accommodations as soon as possible. · Get in touch with your SSD coordinator sophomore year to get accommodations in place for both the SAT and ACT. · Advocate for maximum accommodations even if SSD coordinator expresses skepticism. This skepticism usually occurs in cases of multi-day testing, 100 percent extra time, and reader/DVD assistance. · If multi-day testing for ACT, take it over four days even though schools usually assume/prefer you take it over two days. · Do not take any practice SATs or ACTs until the student has some idea of what he or she is doing, especially under regular time conditions. Free practice tests are not free. Negative experiences have consequences, so “getting to know the test” and having a poor result is getting to know that you “hate”/”can’t do” that test. Every student has a limit on the number of practice tests he or she can handle, so save them for when he or she knows what to do, has proper testing conditions, and is taking the test he or she has the greatest potential on. 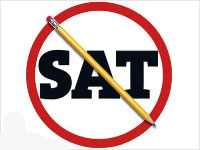 · Get assessed to determine whether you should be focused on the SAT or ACT. Consider issues of content, strategies, timing and accommodations. · One-on-one tutoring. It is nearly impossible for students with learning disabilities to get the specific help they need for standardized testing in a classroom environment.